The main part of this site contains exciting, varied and imaginative soccer drills for practicing with the stars of tomorrow. They are suitable for all ages from the U5s to U10s. Particular emphasis was placed on age-appropriate content, which in turn does not train the kids just one-sided and soccer specific. Soccerpilot’s mobile soccer training content offers you the possibility of using your iPhone, or another high-end appliance, to view wide-ranging training information. Soccer coaches can view interesting articles about soccer and training in high definition via their mobile phone. 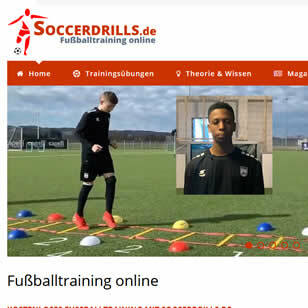 There are already more than 1,000 animations online at www.soccerdrills.de, as well as plenty of interesting articles by very well-known soccer experts.